For the silhouette cards, I started with 4x6 profile pictures and carefully cut out the exact features with a pair of small, sharp scissors. I found it harder to cut out these smaller photos than the 8x10 pictures I used for the wall art. It isn't a bad idea to get a couple copies in case of errors. Using a pencil, I traced around the cut-out photo onto black card-stock paper. I cut out the silhouettes just inside the pencil mark. If you are feeling adventuresome, try adding a few hair details. Or you can just keep things simple. Either way, I think they look great! Erase any remaining pencil marks. I've been crazy busy around here, so I didn't have as much time to experiment with Valentine's card styles as I would have liked, but here are two ideas. 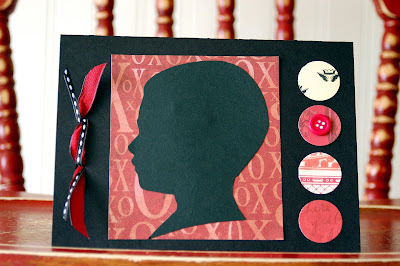 If you want a way to incorporate multiple silhouettes, try making a little booklet. Here I cut a standard-size piece of black card-stock paper into fourths. I used three different red monotone patterned papers for the backgrounds and glued down the silhouettes, leaving a bit of extra room at the top to attatch the cards together. I added a fourth page for a Valentine's message. I found a box of vintage-style Valentine stickers and thought one would look nice. I couldn't find my white gel pen anywhere, so I'll have to pick up a new one this evening. I think I'll write each boy's name at the bottom of each silhouette and then write a message on the last card. I punched two holes at the top of each card and tied them together with ribbon to make a little booklet. 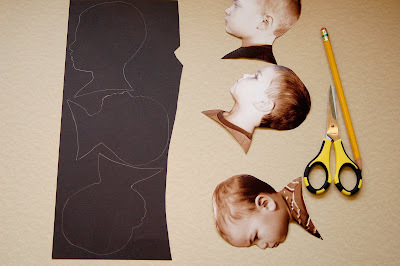 They will be easy to take apart if the recipient wishes to display each silhouette or add them to an album. I made a second card using one piece of folded black cardstock. Recognize the circles? I thought it would be fun to add that element to a card. In fact, if you don't have silhouettes, I think a card with a collage of small circles or other repeated cut-out would be fun. 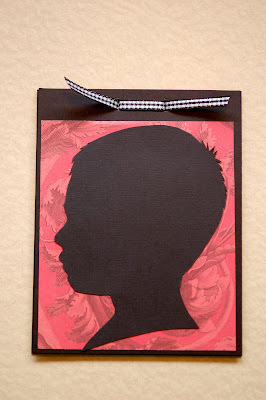 Using a variety of pink and red patterned paper and possibly a heart punch would make a great Valentine's card. It would be easy to use magazines and catalogs for the patterned paper when the punches are small. 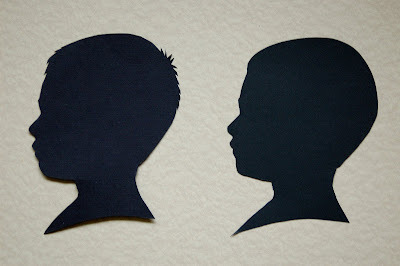 My cousin, Amy, made small silhouette cut-outs and glued them to petite artist's canvases (painted with a background color) as Valentine's gifts for the grandparents. What a terrific idea! UPDATE: Bella Art Girl posted pictures of the Valentine silhouettes she created before my post was up. Isn't that fun? These are wonderful. Thank you so much for sharing this idea and the inspiring pictures. This is my first time stopping by and I love what you've got going on here. Love the information about homeschooling. My kids are little and I've been debating preschool. Love the silhouette cards! Had I only found you a few days ago so I could send them to the grandparents. Heidi, those are just wonderful! I have wanted to do silhouettes of my crew, so you have inspired me to consider it sooner rather than later. Thank you for sharing your handiwork. this is a lot of pressure you know...decorating....being crafty...gosh! Kambria~ I happen to know you are at least crafty! I remember your stacks of scrapbooks. :) You can do it... rah! rah! rah! :) No pressure, though, LOL. Amazing! Fabulous! I think I could DO these!!! I love how you backed these with the red paper - it adds depth and interest. I've done silhouettes using photoshop - enlarged the pixels and the blacked out the profile, made the background white. It took a while but the lines were crisp with the hair detail still in tack. But I like the use of texture and color which you've added. 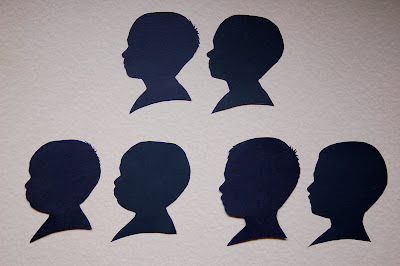 I need to update my kids silhouettes from 3 years ago, doing your method. That's it! You're moving to Toronto and becoming my new bestest friend. You're just so talented. Beautiful! Quick question... when you glue paper/card stock to a canvas what kind of glue do you use? Those are great, Heidi! I love how creative you are. Everything you create is beautiful. I just did our valentines inspired by your earlier mantle post and then saw your post from yesterday this morning. My version is on my blog this morning. Thanks for the inspiration. I Was Just Thinking~ That sounds way too complicated for me. :) It would be nice to have the hair details correct, though. They were tricky, even when I was fudging a lot. Jennifer~ I think I just used glue stick, believe it or not. It is what was handy. Bella Art Girl~ I loved your silhouettes and card. Ours *do* look similar. I put an update on my post with a link to yours. Fun stuff. You could try tracing around the silhouettes from the backside. This way, you wouldn't have to erase any extra pencil marks when you are done. Just make sure to have any special textured papers, or gloss papers, or... whatever orientated the correct way. 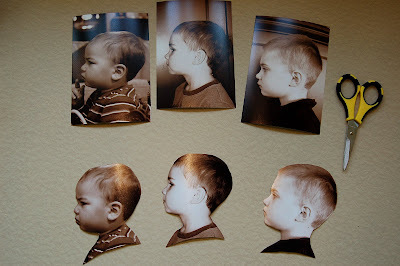 My Mom had these done for all us kids back in the days and I have wanted to do it with my 4 boys for a long time now....Thanks so much for the informative tutorial, I am doing it this weekend for sure!!!!! This is so neat, never would have thought to do that. Thanks for sharing.